A U.S. Customs and Border Protection outage caused headaches for travelers around the country on Monday, Jan. 2, 2017. A US Customs computer outage was affecting operations at airports nationwide Monday night, officials said, creating long lines of disgruntled passengers. Airport officials and travelers across the country reported delays ranging from 30 minutes to two hours. Customs and Border Protection officers processed international travelers through "alternative procedures" while the agency scrambled to repair what it called "a temporary outage with its processing systems." "Travelers at some ports of entry are experiencing longer than usual wait times and CBP officers are working to process travelers as quickly as possible while maintaining the highest levels of security," CBP spokesman Daniel Hetlage said in a statement. The outage affected passengers on more than 30 flights into Miami International Airport beginning at 6 p.m., spokeswoman Suzy Trutie said. The Port Authority of NY/NJ reported minor delays at Newark Liberty International Airport and 90 minute delays at John F. Kennedy International Airport. The outage lasted about 90 minutes at Hartsfield-Jackson Atlanta International Airport before computers were up and running again, US Customs Border Protection spokesman Rob Brisley said. 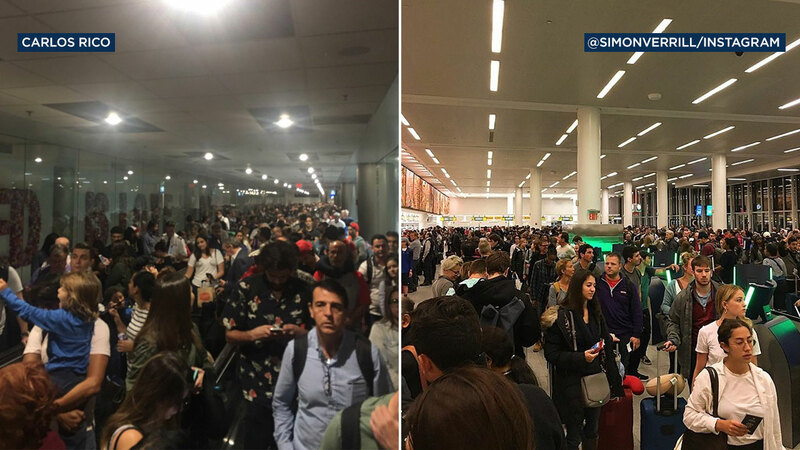 As of 8 p.m. Monday, images continued to flood social media showing long lines in customs at various airports. Jennifer Powers-Johnson was returning from a London family vacation when she arrived at Salt Lake City International Airport on Monday. As she waited in line at customs she learned from a cousin via text message what was causing the holdup, she told CNN. "Delta had us all line up after we landed and it took a while before customs was even able to find us a place where we could wait because the airport is so small," Powers-Johnson said. "I would not have had any idea of what was going on if my cousin did not text me." "When we got to the place in customs where you scan your passport, my brother and sister scanned theirs and got through fine. Mine did not scan and I had to get in a different line. That was the line that took so long," Elendu said. Elendu still has one more leg of his trip as he heads back to Portland, Oregon, for school. A Customs and Border Patrol spokesperson released a statement saying, "U.S. Customs and Border Protection experienced a temporary outage with its processing systems at various airports today beginning at 5:00 p.m. EST and ending at approximately 9:00 p.m. EST. All airports are currently back on line. CBP took immediate action to address the issue and CBP officers continued to process international travelers using alternative procedures at airports experiencing the disruption. Travelers at some ports of entry experienced longer than usual wait times as CBP officers processed travelers as quickly as possible while maintaining the highest levels of security. During the technology disruption, CBP had access to national security-related databases and all travelers were screened according to security standards. At this time, there is no indication the service disruption was malicious in nature."